After a super busy day, Justin and I wanted to grab a quick and casual meal. 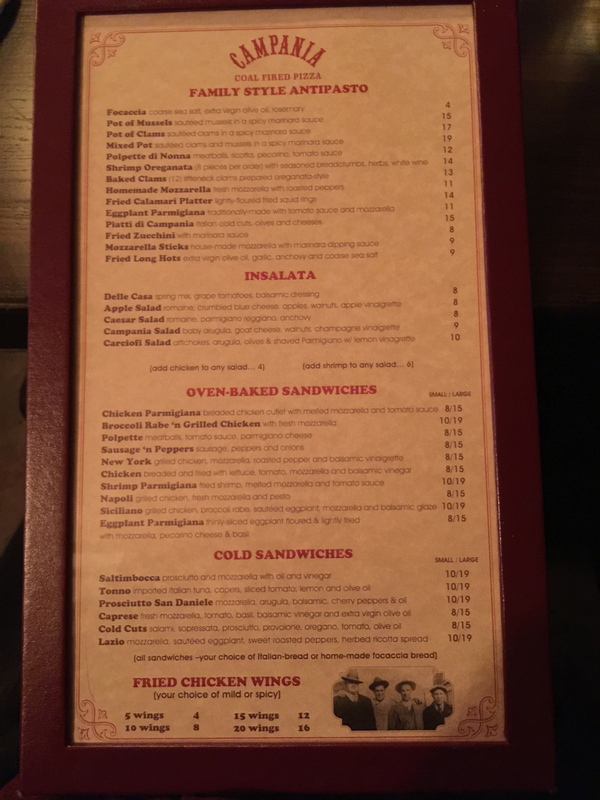 Not long ago, I had planned to try Campania with my good friend Courtney, but when we arrived on a Friday night, there was over an hour long wait, so we went elsewhere. Campania is located in the former Nove. The restaurant underwent a renovation, giving the space a much more casual and cozy feeling than the previously upscale Italian restaurant. I figured, with such a long wait time, the place must be really amazing. I have seen these menu options probably at every single pizzeria, ever. Boring. But I held out hope – maybe these very classic and basic dishes were going to be the most amazing versions of them that we had ever tasted! The salad was gross, and boring. 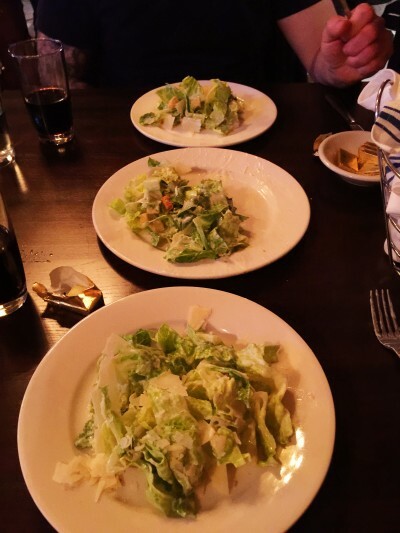 The “anchovy” – typical of a Caesar salad and described on the menu – was missing completely, and the dressing tasted like a watery Wishbone dressing. The fried long hots, described as being served with “extra virgin olive oil, garlic, anchovy and course sea salt,” was by far the most disappointing bite of food I have had in a very long while. 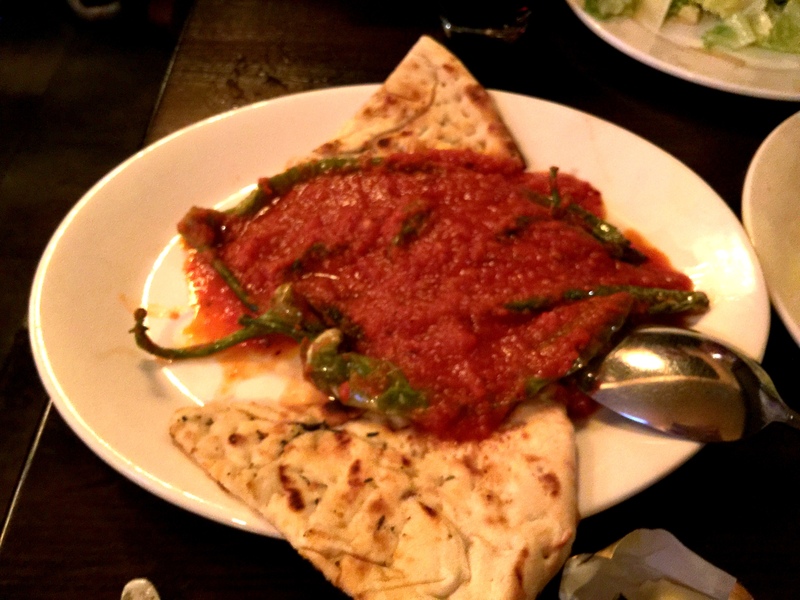 What came was a sloppy dish of peppers with marinara sauce – no visible or taste-able course sea salt, garlic, or anchovies. Even the peppers were bland. I paid $9 for this crap? 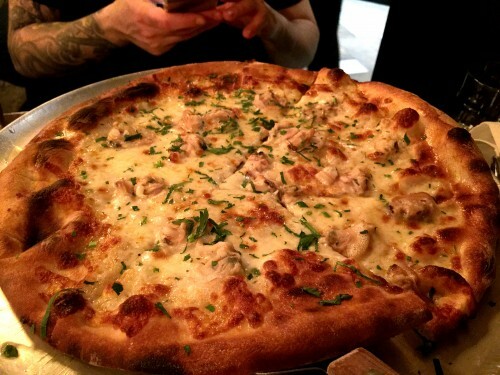 The clam pie came out kind of cold and with not a lot of clam on top. It was ok. But like I said, this is Staten Island. I can spit and hit a decent pizzeria from basically any location. The shrimp parmigiana sandwich was a complete letdown, too. Very stingy with the shrimp, I found myself mostly eating bread. And the shrimp themselves did not taste fresh or flavorful. 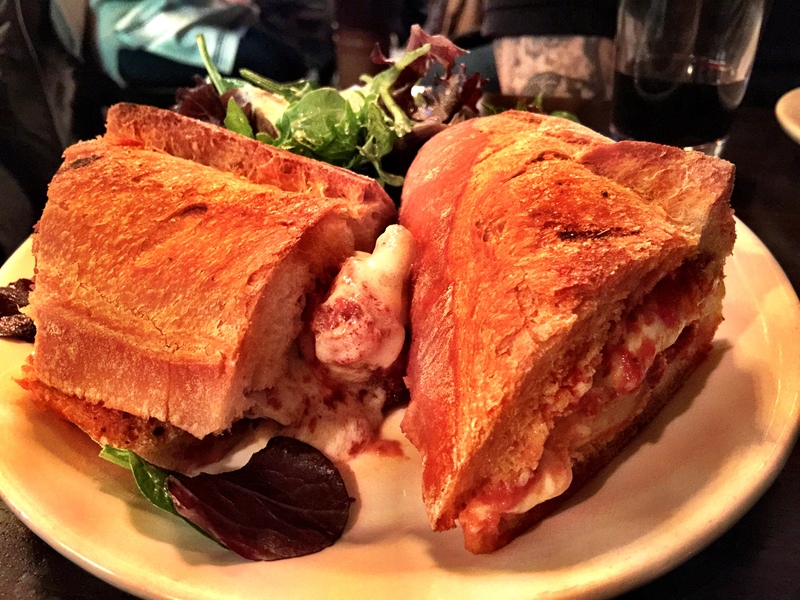 At the end of the shrimp parmigiana sandwich, I was so fed up, I didn’t even entertain the idea of dessert – I am certain it was just as awful as the rest of the meal. You might be thinking, “Wow, harsh review,” at this point. But let me finish. We were seated at probably the worst seat in the place – when you walk in past the bathroom and bar, we were right behind the POS system and a little dividing wall all the way to the left of the restaurant. The end of the bar had a garbage pail at the end of it, right next to where the POS system was, and the entire wall – essentially right above my head – was covered in fruit flies. So swatting them away from my food for the entire meal was really awesome. In addition, I saw a bus boy bring a tray of “clean” glasses out to the bar, and place the tray on the garbage pail, to be later picked up by the bartender or another bus boy. So our clean glasses are probably covered in fruit fly larvae. Aside from the utter filthiness and flavor-less food, the service itself sucked. So, Campania, I congratulate you on my first ever one star Baconboozer rating. 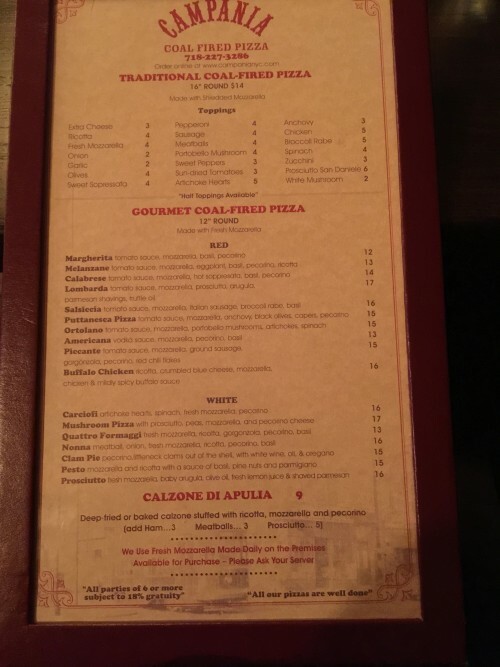 I don’t care if you are a local or out-of-towner, I strongly encourage you to skip this place, and try out some of Staten Island’s truly worthy pizzerias. And if you’re in the mood for something fancy/unusual – pizza-wise – Pizzeria Giove is your best bet. The full review of that is coming soon!